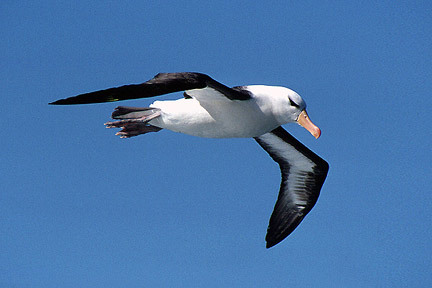 The Black-browed Albatross (Diomedea melanophris) has obtained its name from the dark stripe that covers an area around the eyes of the otherwise white bird. These sea birds have excellent flying skills which allow them to glide for days, using the air streams above oceans. This species reach quite a large size, with body of 80-95 cm and, just like all Albatrosses, a huge wingspan of up to 2,5 m. Both sexes have a dark, almost black top side of the wing and a gray tail, while the rest of the body is completely white, except for the long, yellow beak. They inhabit waters south of the equator, with populations all around the southern part of the globe. Despite the large size, this Albatross has poorly developed muscular system, thus, in flight, this bird relies mostly on the wind, thus most of the population inhabit territories between 30 and 60 degrees south, where the strongest winds can be observed. Colder waters are also rich with fish, thus making them perfect for the Albatross. This species usually spends most of the day gliding 15-20 metres above the surface of the ocean, looking for prey. They feed mostly on octopuses, squids, crustaceans and a variety of fish, and sometimes even smaller birds. The Black-browed Albatross is also often seen following large ships and eating garbage that is tossed overboard. These birds often have to dive or at least land on the water to access food, therefore the bird slushes its feathers with a special secrete coming from the stomach, making them water-repellent. 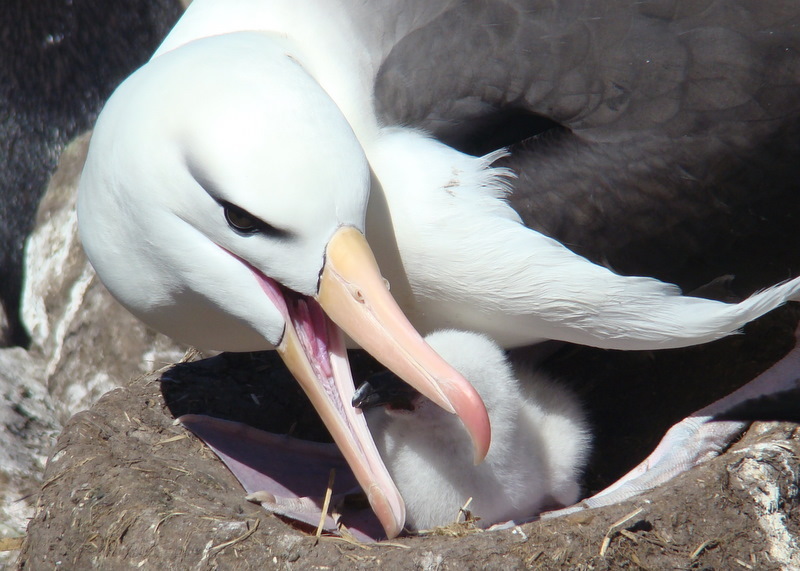 Black-browed Albatrosses nest in colonies on islands quite far from continental lands. Although they form life-long mating pairs, both the partners meet only during the mating period, spending the rest of their time alone. Even after many years in “marriage”, these birds still perform a traditional rut dance, flying around each other and clacking the beaks. After copulation, the pair constructs a nest of mud or clay in a high, secluded spot. 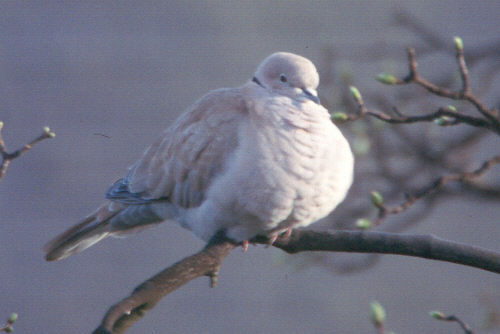 Only one egg is laid at a time, and the male sits it, while the female feeds. When the chick hatches, both the parents feed it with half-digested food, and they take turns with the hunting, while the other one guards the offspring. 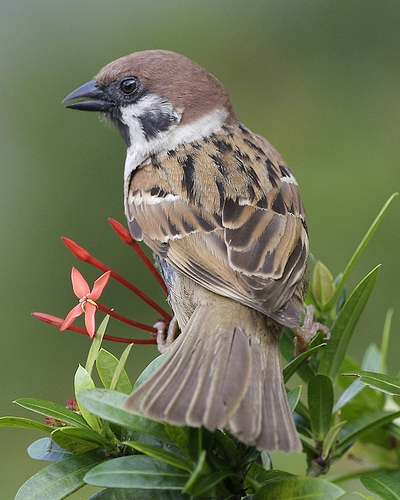 They have an extremely high life expectancy for birds, reaching up to 30 years. Spending their lives in the sea, far from most other animals, the Black-browed Albatrosses can be sure they won’t be ambushed by a ferocious predator. 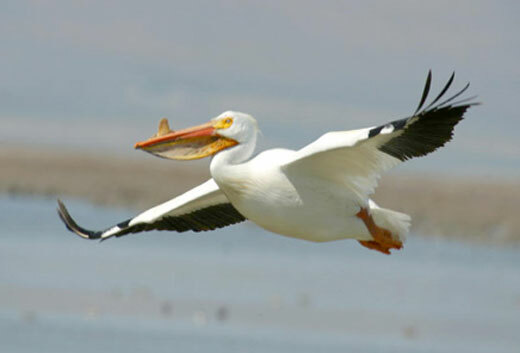 That is, except for the man – seamen sometimes shoot these birds for fun. Still, having no other enemy than the man, the Black-browed Albatross is the most widespread species of Albatross, holding the strongest population and showing no signs of decreasing in numbers.